Community involvement has always had a very important role at Christ the King. Anyone visiting the church will see a large example of this dominating and brightening the north wall. Our ‘Rainbow Panel’ was the culmination of 2 years work by a team of over 20 people, and involved over 1500 members of the community throughout our parish of Battyeford and beyond. There are squares from people all around the world and a group of visitors from our Link Diocese of Mara, in Tanzania, helped in the final stages of assembly of the Panel. The youngest contributor was just nine days old and, at the other end of the scale, the oldest was a hundred and five! The panel is composed of 2000 individually made 3 inch squares each bearing a cross. A variety of techniques has been used, ranging from knitting to embroidery, beadwork and printing. The squares come together to form an amazing sunburst through the rainbow. 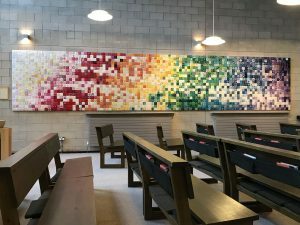 The whole panel measures 5 feet high by 25 feet long, and part of its function is to brighten up the rather austere walls of our church. We hope that this addition to our church will truly represent our determination to be involved with the whole community of Battyeford, and the world at large. It is far more than that, however. Each contributor was invited to offer a prayer as they made their cross – every square a prayer! And so, the panel is a physical symbol of a great deal of thoughtful prayer and reflection about our world. The rainbow was a great symbol of God’s promise to Noah and those who came out of the ark with him, that God would from that day on protect his people. We hope that our panel will continue to remind us, and you, of the wonder of God’s creation and of God’s promise. In 2015, Palm Sunday was a joyful occasion at Christ the King. 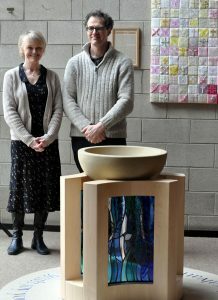 Our stunning new font, having arrived only two days previously, was installed and dedicated by our diocesan bishop, the Rt Revd Nick Baines. The font is the result of a long process during which elements of the design were distilled and refined, under the guidance of designer David Wilson, from the Farsley firm, ‘Dovetailors’. 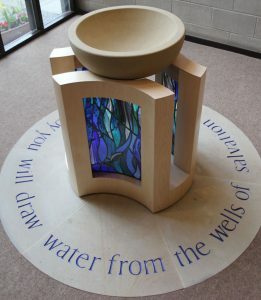 He then recruited Celia Kilner, an artist who works in stone, to make the bowl and the stone base, and finally Caryl Hallett, who designed and made the stained glass elements. The finished product is a testimony to co-operative effort and fine craftsmanship which will enhance worship in our church for generations to come. On a day that promised much joy, beauty and celebration, we were reminded of our imperfections as we discovered that the plug at the base of the font was not a good fit and there was leakage. Disaster? Not a bit of it. The bishop adroitly adapted his sermon to such an extent that we were left wondering if it were not deliberate! He even repeated it the next day on his Thought for the Day on BBC Radio 4’s Today programme. In constructing the font, Dovetailers’ David Wilson said that his biggest design challenge had been to build sufficient strength into the timber frame to support the massive weight of the solid stone bowl. Hidden from sight there is 20mm steel reinforcement to stop the bowl forcing the timber supports apart. Getting everything to fit was the next puzzle – those beautiful curves don’t just meet each other by chance! It was the first font that Dovetailors have made, and David was pleased with it. CtK learned of his talents by seeing his work in the refurbished Wakefield Cathedral, where he was responsible for the Altar and the Aubry (lectern). Caryl (pictured above with David) is also pleased with the result, and with her contribution to it. The biggest challenge for her was how to create the concave shapes called for by the design, as she had previously only worked on flat planes. Bishop Nick commented on the beauty of the glass panels and on the way we look, not just at glass, but also through it to see the light beyond. He urged us, too, to let people see the light through us – the light that is created through our faith and our belief in the resurrection. Celia’s biggest challenge was rather more down to earth. The stone she used was sourced at Hillhouse Edge Quarry, high above Holmfirth, and she was working there, on site, in the middle of January! Getting the words on the base to be evenly spaced and yet not coincide with a join in the stone circle also took some working out but she managed it perfectly, as can be seen in the photos. We thank you Lord that as we look at the font we can appreciate not only the beauty we see but also the symbolism it represents. A font is both a symbol of the tomb and the womb, the stone rounded, deep and strong is supported and surrounded by wood reminding us that Jesus died on a wooden cross but overcame the tomb of stone to rise through the waters of salvation and bring us to eternal life. The glass which dances and sparkles in the light reflects the colours and symbols of baptism and lifts our hearts to you. Christ Church was built complete with west tower, on a site given by Mr Benjamin Wilson, by the local firm of F & E Ellis at a cost of £1778, and was consecrated by the Bishop of Ripon on the 28th of October 1840. 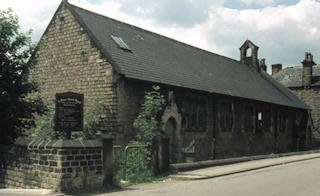 Originally proposed by the Reverend Ralph Maude, the parish was finally constituted in November 1841 and a former curate of Mirfield Parish Church, the Reverend Thomas Nevin, became the first vicar. A year later, a school was built next door and in 1845, a Girls’ school was built next door but one, (both are now private dwellings). 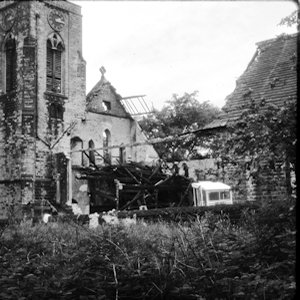 Only after that, was a Vicarage built, showing where the priorities of the church management lay at that time. The Tower Bell was installed in 1843 and an Organ in 1851. 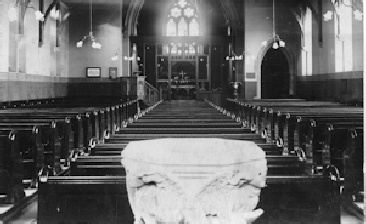 In 1858, Miss Fanny Wormald of Field Head donated the font. 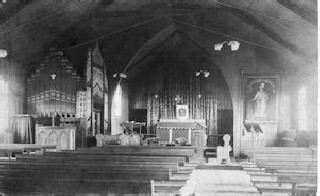 The chancel was built in 1865-6, however, a plan to replace the side isles with a central one was abandoned because of cost. 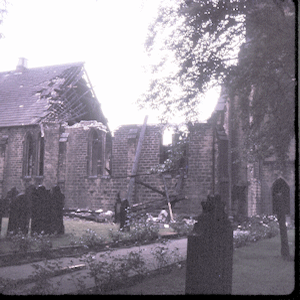 The church continued relatively unchanged until 1971 when it was severely damaged by being vandalised and set on fire and had to be demolished. Around 1868 a Mission was started at The Knowl. To provide for a second curate to work in that part of the parish, an endowment fund was set up which raised £2000. In 1874 a building was erected to serve as St Peter’s Mission Church and a school. 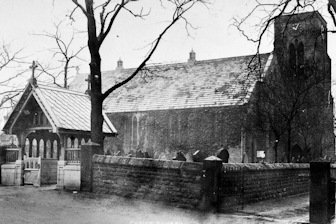 In February 1893 the new St Peter’s church was consecrated. Built of wood and iron the church was built behind the School House. 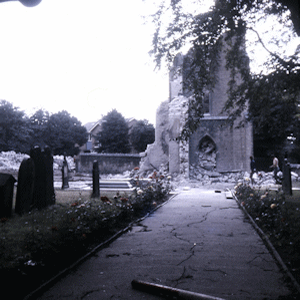 After the 1971 fire at Christ Church, the two congregations worshipped together at St Peter’s. 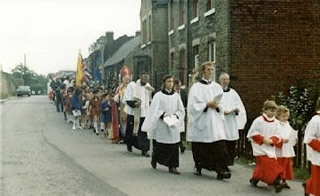 On 22nd September 1973, the two congregations came together as Christ the King, they left St Peter’s for the last time and processed to the consecration of the new Christ the King Church. 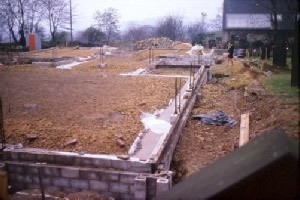 After the devastating destruction of Christ Church, it was decided that a new church would be built on the site, and by September 1972, the site was cleared ready for the new building. 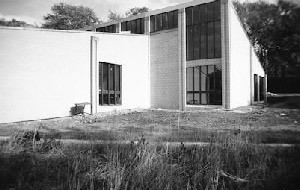 In November 1972, the building was started. 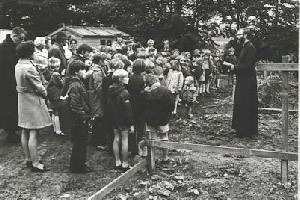 The vicar, Revd Eric Crowe presided over the laying of the foundation stone with the children of Battyeford C of E School. 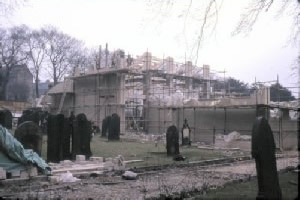 The building work continued over the next 12 months until the church was ready for consecration in September 1973. 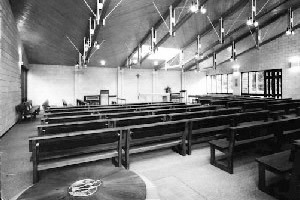 The church was built originally to seat about 150, but with a growing congregation, it soon became clear that the worship area was not big enough to seat everyone at big celebrations. So, 10 years after the foundation stone was laid the builders were back again to build an extension on to the church. 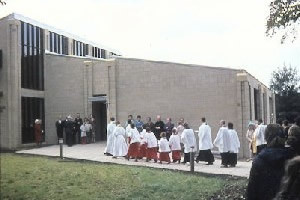 One year later, and the extension was finished, adding a further hundred seats and giving Christ the King room to grow. For many years (chiefly through the 90s, but also before that) the church here attempted to grapple with the difficult question of a deteriorating building known as the “Parish Rooms”, two doors down from the church. 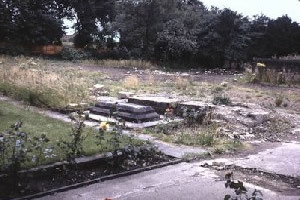 The building, used by many organisations, mostly not directly linked to the church, had deteriorated over the years and needed radical renovation work. The problem raised questions about the advisability of spending a huge amount of money on renovation. The idea of selling the Parish Rooms began to surface through the late 90s and soon after 2000 we began to look seriously at the possibility. In addition to our community focus, there were continuing maintenance problems with the main church building which were severe enough to suggest the need for new heating and lighting systems as well as the need for a completely new roof. We planned to address all these issues by putting the factors together in the Development Project. This would provide, on one site, a church building with sufficient flexibility for use by various local groups and present us all with a challenging opportunity for the further development of our links with the surrounding community. 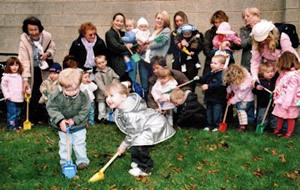 In September 2005, after much fund-raising on the church’s part, we were awarded £282,163 by the Big Lottery Fund, to make up the amount we needed to redevelop our church premises for wider community use. 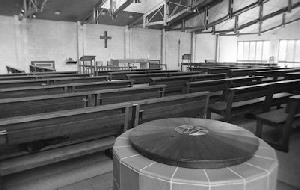 The total sum of £550,000, available for the redevelopment, came from the proceeds of the sale of our former Parish Rooms, the Big Lottery Fund grant, donations from many sources, and the considerable sums we raised through our fund-raising work. Building work began in February 2006 and proceeded in two phases, with all our activities happening in one half of the building while work was being done on the other half. By the end of October 2006 the building work was completed.